After spending time polishing up my statistical knowledge I created another energy industry prototype model built on what I learned so far. This prototype uses exactly the same data as the Energy Industry Investment Model. The difference is that the Energy Industry Investment Model uses unadjusted data while the prototype uses seasonally adjusted monthly % change in data which eliminates serial correlation and makes the data Covariance Stationary. Serial Correlation in a situation in which previous period data points are correlated with future periods. For instance if you measure a car's MPH as it accelerates, A car will show a positive relation between time and MPH. Covariance Stationary loosely means that the data is anchored at a value and its variance doesn't change much. For example, a car traveling on the highway with light traffic would center its speed around 65 MPH even though there are periods where the car will deviate from 65 MPH due to other highway cars shuffling between lanes. Without getting too deep into statistics, the data needs to be transformed to eliminate Serial Correlation and become Covariance Stationary before being fed into the model. Failure to fix them will reduce model accuracy. With that in mind it is time to show preliminary results of the new prototype model for the energy industry. Does it knock out the Energy Industry Investment Model? My charts show that the prototype is unable to wrestle the crown away from the Energy Industry Investment Model. The prototype model results seem flat and fails to capture the volatility in XLE prices sufficiently. This puzzles me. Why would the current model built without considering seasonality, serial correlation, and covariance stationary data be more accurate? 1. The current Energy Industry Investment Model despite being built without advanced statistical practices is so effective that it didn't material affect accuracy. 2. The prototype model is built missing a critical statistical transformation or process that I am not currently aware of. I will explore this and get back to you. My outstanding to-do-list still hasn't changed. Running statistical tests and building a better model is still my first priority. The only higher priority is watching the Mayweather/Pacquiao fight Saturday. Thank you for reading. I'm looking for a Pacquiao victory. 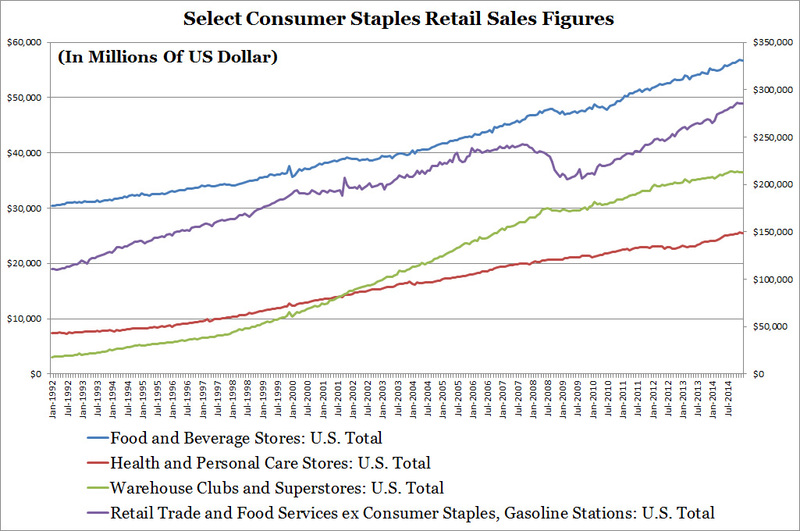 On Sunday, I published my blog: "Is The Consumer Staples Industry Just Spinning My Wheels?". I presented a lot of macroeconomic data from the U.S. Census Bureau and Bureau of Economic Analysis. It took a lot of time to find and compile them, but I think it's good information for me to follow. The blog also used the Consumer Staples Industry Investment Model rebuilt with U.S. Census Bureau adjusted merchant wholesaler data. Here is a visual representation of how the data changed and how the rebuilt vs original models look. It didn't have a material difference on model results. This week I've also begun reviewing my CFA quantitative methods chapters in preparation for model testing. I've been experimenting on various ways to seasonally adjust the crude oil and petroleum products production data for my Energy Industry Investment Model. A simple moving average is ruled out because it underestimates the magnitude of near term changes in production. Something more sophisticated will be used. I was also able to find someone knowledgeable about statistcis in my network who can guide me if I get stuck. In the near term I will focus on model testing rather than publishing articles. I'll continue to provide weekly model results on both the Consumer Staples and Energy Industry models on my website. Is The Consumer Staples Industry Just Spinning My Wheels? Recently, the U.S. Consumer Staples Industry as represented by the Consumer Staples Select Sector SPDR ETF (XLP) as well as his friend the S&P 500 are struggling for direction. It's important to look at the S&P 500 as stocks are influenced by the overall stock market especially with significant XLP's large cap membership. Historically, the pair have had distance between them. 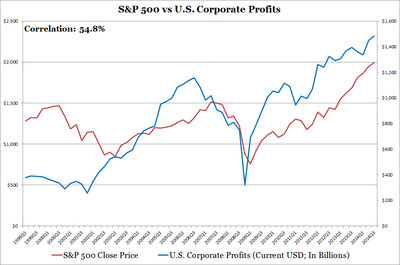 During the Dot Com era they moved oppositely, while during the mid 2000s, XLP lagged the S&P 500 for several years. Since the Great Recession, XLP and the S&P 500 are best friends. Industry Data is supportive of growth as the National Retail Federation expects retail sales to grow 4.1% in 2015, on top of last year's growth of 3.5% last year. Although my charts below for Retail Trade and Food Services does include automobiles and restaurants, I see automobiles and restaurants moving together with retail trade as spending and consumer confidence improves. The University of Michigan's Index of Consumer Sentiment reports an index level of 95.0 for March 2015, which are pre-recession levels. I'll talk more about the index under macroeconomic data later. Going back to the charts, I broke out the consumer staples associated retail data which highlights the consumer staples' less volatile retail sales. The exception is the warehouse clubs and superstores group which grew rapidly before the Great Recession. I graphed volatile gasoline station sales separately from retail sales. Despite the current crude oil price slump, consumers are not spending their gas savings on other retailers. My Consumer Staples Industry Investment Model doesn't take into account retail sales directly because it's built on merchant wholesaler data. When I first created the model I saw a better fit with merchant wholesaler data. The reason is because many large consumer staples companies have their own distribution and warehouse networks regardless of whether they participate directly in retail sales. Their performance would more closely mimic wholesalers rather than retailers. I show below how similar nondurable wholesaler sales is compared to consumer staples retail sales. The Consumer Staples Select Sector SPDR ETF (XLP) as well as the S&P 500 contain many very large companies with global operations. The macroeconomic environment will have a larger impact on these companies. It's easy to get distracted by the U.S. dollar's rise, oil prices, and slowing world economies. The January 2015 International Monetary Fund's (IMF) GDP estimates include these global effects. The below shows that World Real GDP and U.S. Real GDP is increasing but U.S. growth slows in 2016. U.S. sales are still a significant part of consumer staples companies. 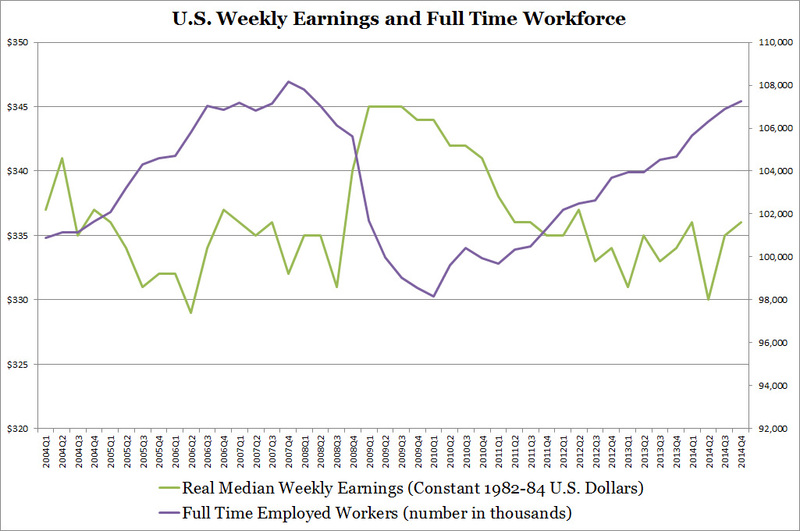 Focusing on the medley of U.S. economic data in the two charts below, we see that despite a lack of growth in full time real median weekly earnings, the size of the full time workforce has almost increased back to pre-recession highs. This larger workforce provides more disposable income for a growing U.S. population to spend on consumer staples products. Despite the recent weak jobs report, it's important not to lose sight that job growth was positive. As future U.S. population growth in the far future slows, consumer staples stock performance may level off. 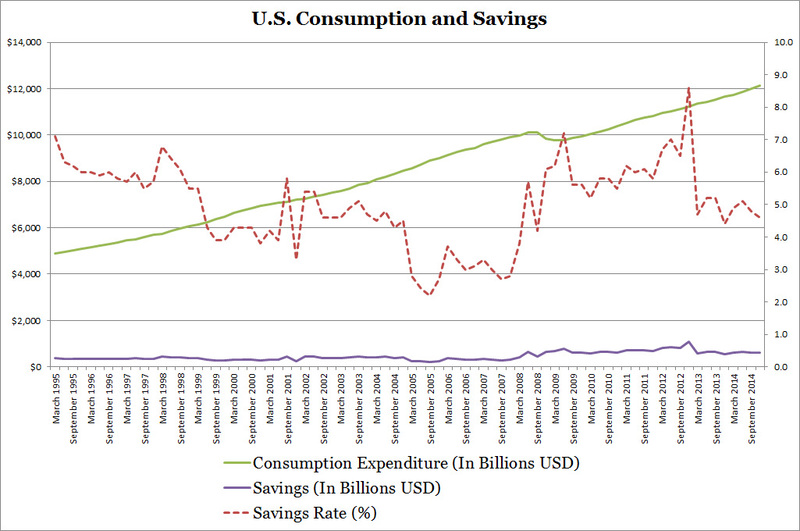 The charts below shows personal consumption expenditures, savings/savings rate, and consumer sentiment. Savings rate is inversely related to recessions while consumer sentiment moves with recessions. I would pay close attention to these indicators. 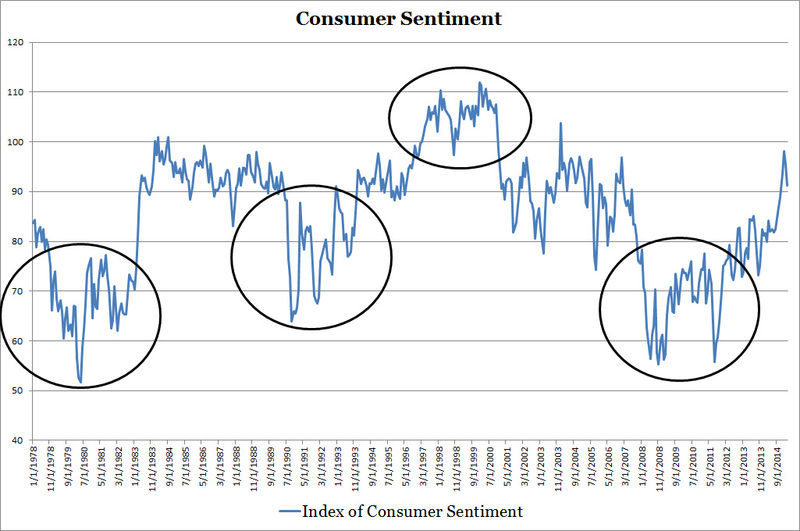 Consumers are spending more as consumer sentiment is rising, this can be shown in the savings rate decline. The University of Michigan reports that for March 2015, consumer sentiment reached an all time high. In closing it mentions that consumer spending will rebound due to favorable job opportunities and that few consumers expect rising interest rates to hamper their purchases. This is great news for investors. I'm excited that both industry and macroeconomic data are encouraging. After entering merchant wholesaler, National Retail Federation estimates of retail sales as a proxy for wholesaler sales growth, and general stock market (S&P 500) data into my Consumer Staples Industry Investment Model I calculate a mid $50 value for XLP. 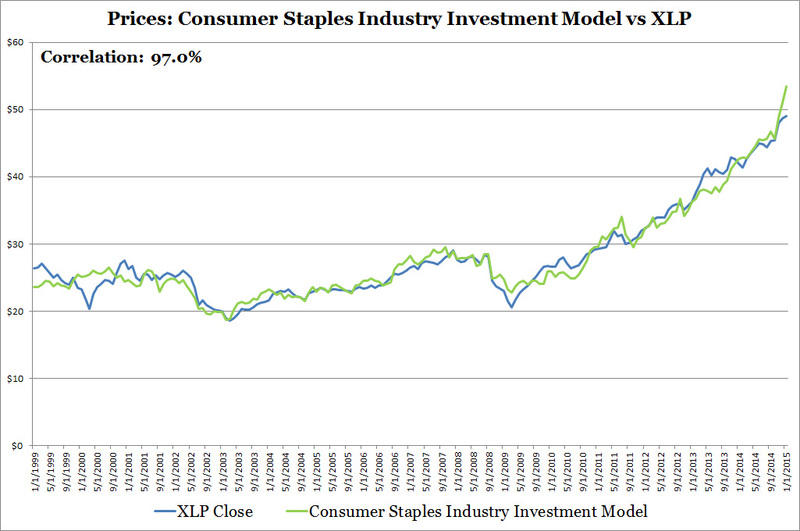 I also plotted historical XLP prices versus the Consumer Staples Industry Investment Model to show model accuracy. At the moment, I don't have a quantitative view of general stock market performance (S&P 500), but I'm working on a model that considers GDP and consumer sentiment data which can later be combined with the consumer staples model. Is the Consumer Staples Industry Just Spinning Your Wheels? 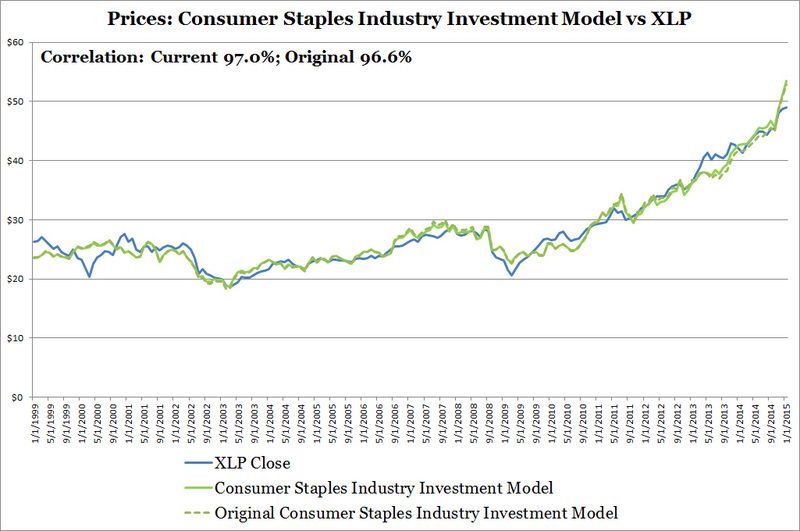 My model estimates that the U.S. consumer staples industry is slightly undervalued based on current industry and macroeconomic data therefore the consumer staples industry as represented by XLP has room to grow. 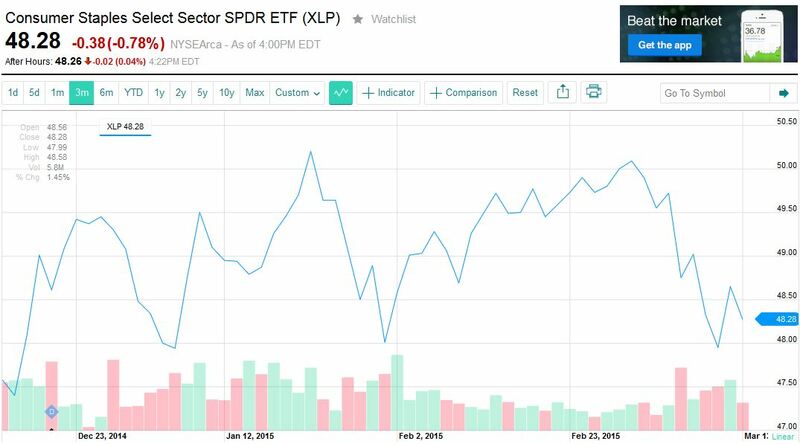 Because the S&P 500 is XLP's best friend, the stock market's volatility affects the consumer staples ETF's price. Luckily for both friends, the U.S. economy hasn't peaked. Consumer Sentiment has only been above 90 for four months but generally has to stay at a high level for an extended period of time before a recession comes along; also the savings rate hasn't fallen below 4%. Finally positive GDP growth from the IMF despite and positive U.S. economic data provides support. Lastly, the consumer staples industry produces essential goods that will still be in high demand regardless of the economy making consumer staples stocks less volatile during economic downturns. If you're not convinced about my bullish view on the economy you should still consider having consumer staples stocks for your equity portfolio. I got caught up in another busy 2-3 weeks at work. Hope I don't need to head into the office this weekend. At the rate my work is going I'm at risk of burnout. 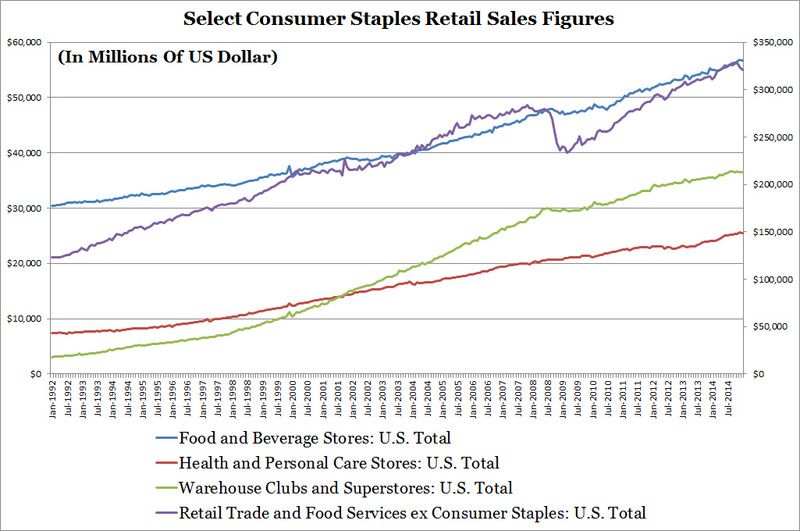 First, I'm still working on the consumer staples article: "Is The Consumer Staples Industry Just Spinning My Wheels?". I'm about 60% done. Besides work and recovering from a busy work schedule slowing down my progress on the article, I'm taking more time to conduct deeper analysis and to provide more data to back up my points. Second, it's been brought to my attention that more statistical tests are needed on my investment models to confirm/increase accuracy and to ensure that it's built properly. To give you an example, picture an investment model as a car. The car runs and has been tested in various real world driving situations (backtests), however, the engineers have not conducted detailed simulation runs to document engine response, fuel efficiencies, and breaking ability (statistical tests). Therefore, for the next few weeks I will be running a set of statistical tests on my models. I've already reached out to statistics experts in my network to guide me in the right direction. I will blog once I have results. Third, I'm going to make tweaks on both the Energy and Consumer Staples Industry Investment Models. For the energy model, I am going to adjust the crude oil and petroleum production data for seasonality, that should smooth out model results. I don't expect it to significantly impact model results, but it will require me to rebuild the model and re-run the backtest. For the consumer staples model, the U.S. Census bureau adjusted historical data based on their Annual Wholesale Trade Survey and results from the 2012 Economic Census. This will also require me to rebuild the model and as a safety precaution re-run the backtest. I will try to finish them this weekend. Finish my article: "Is The Consumer Staples Industry Just Spinning My Wheels?". Thank you for your patience as I try to balance work and my website. I was hoping to finish my Stock Market Investment Model last weekend so I can use it for the Consumer Staples Industry Model. Although I wasn't able to finish it, I made enough progress to run the current version of the model with a few minor adjustments. I'm going to feed a GDP forecast through to get model results. Knowing where the stock market may be going will help determine where the consumer staples industry as represented by the Consumer Staples Select Sector SPDR ETF (XLP) is heading. I have finishing the consumer staples article as my must do item this weekend. I will review the data I to build my article. Below is an updated retail sales chart I will likely use for the article. It highlights the lower volatility of consumer staples retail sales, especially during the Great Recession, versus the rest of the retail industry. As a side note, my models are adaptable and can be built on top of other ETFs and mutual funds. I did this for the Consumer Staples Industry Investment Model backtest, I used the Fidelity Select Consumer Staples Portfolio (FDFAX) due to limited XLP historical data. Adding the model on top of other products will be a project for another time. After the consumer staples article is posted, I want to write about the energy industry again. I haven't thought of a topic yet. Today, I read in the news that weekly U.S. crude oil production fell from 9.42 to 9.39 million It isn't much compared to the rise in production over the last few years. 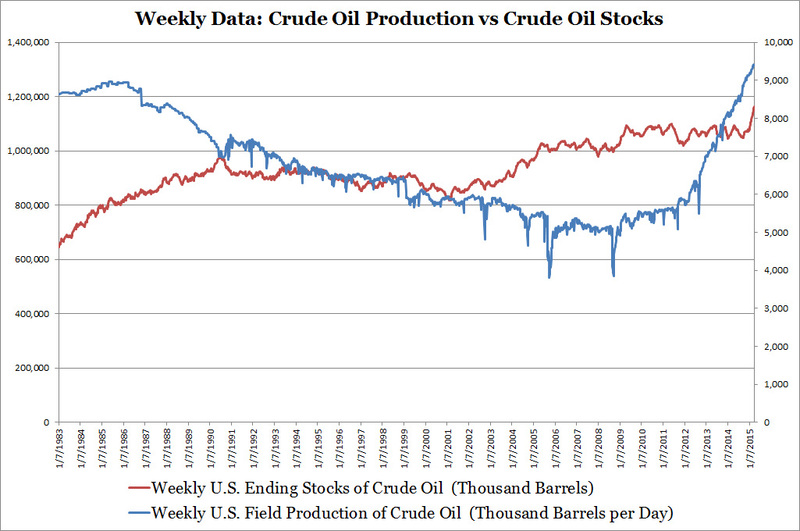 Here is a quick historical chart of weekly crude oil production and stocks where today's drop isn't big enough to see. The red line is the much publicized issue of rising crude oil stocks. In terms of my list, I added building a semi/fully automated energy industry database to pull in EIA and other energy industry data. Having this database will streamline the process of researching and writing. Build the Stock Market Investment Model (tweaking and more backtesting). Finish building the Consumer Discretionary Industry Investment Model. I've wasted/spent/invested the entire day trying to backtest the two alpha versions of the Stock Market Investment Model for the S&P 500 that I created last week. Despite my efforts results have been mixed. Stock Market Investment Model (SMIM) World GDP - uses quarterly World GDP and Consumer Sentiment data. Stock Market Investment Model (SMIM) U.S. GDP - uses quarterly U.S. GDP and Consumer Sentiment data. 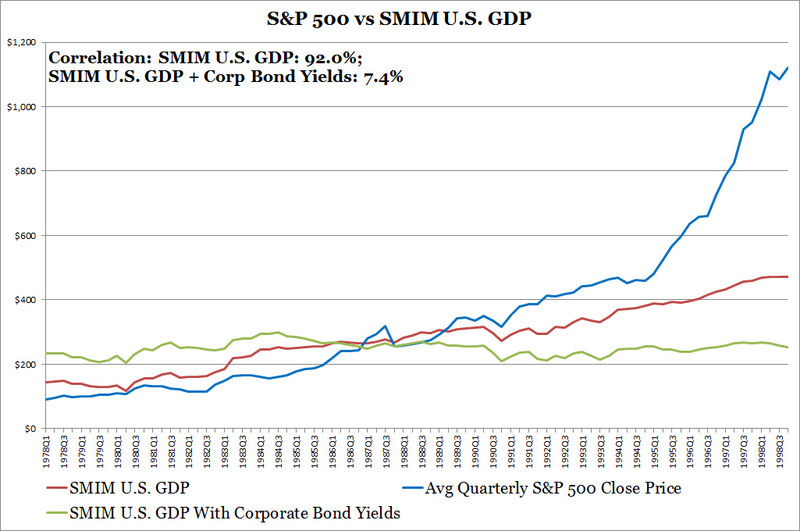 Stock Market Investment Model (SMIM) U.S. GDP With Corporate Bond Yields - uses quarterly U.S. GDP, Consumer Sentiment, and Investment Grade Corporate Bond Yields. I will show backtesting results for each of the three models and then discuss next steps. 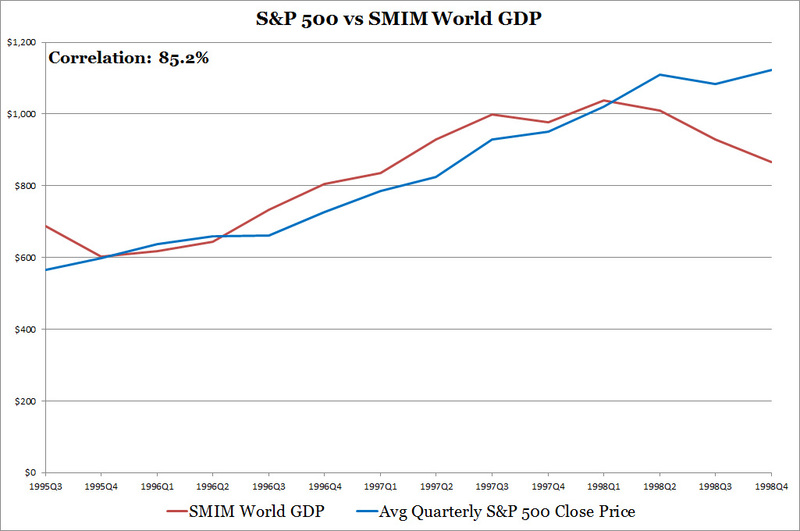 Below, I show SMIM World GDP backtest results using data from 1995 to 1998. The 85.2% correlation is good but the backtest period is too short. I'm not able to conduct it using more dates because the World Bank only has data going back to 1995, however, I might be able to convert the International Monetary Fund's annual World GDP data for backtesting. Another issue is this model's inability to track the rise in S&P 500 in 1998 and the fall in 1995Q3. Both my website models also have trouble from the Dot Com era: 1995 to 2000. I'm hesitant to launch this model. I put the next two models on the same chart below. Results are unexpected. 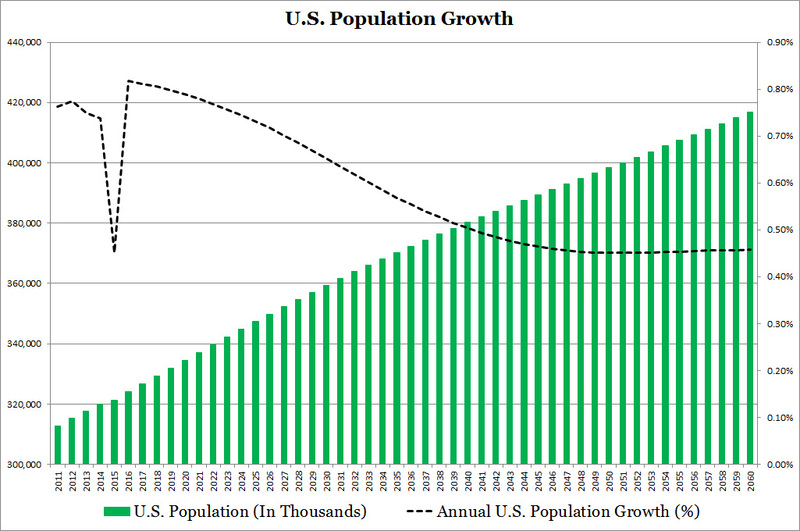 Ignore the large Dot Com era misses after 1995 for now, I will address later on. The SMIM U.S. GDP With Corporate Bond Yield model which had the best correlation out of the three models from 1999 to 2014 collapses with an abysmal backtesting correlation. This illustrates the importance of a backtest. As a side note, when I first developed the Energy Industry Investment Model my initial model collapsed as well during the backtest. The difference this time is that I used fewer four letter words. But anyways, coming back to the SMIM U.S. GDP With Corporate Bond Yield, I investigated and found that the model had a strong positive relationship between corporate bond rates and stock market performance, which isn't true historically nor logically. The Federal Reserve pumped out low interest interest rates in response to both the Dot Com Bust and Great Recession, but the model just saw lowering interest rates concurrently with declining stock market performance. Perhaps, if I can model corporate yields as a leading indicator to future stock market performance it will work. The SMIM U.S. GDP model's backtest correlation of 92.0% is even higher than it's 1999 - 2014 correlation of 85.5% reported on my previous blog. This star model may not be as effective in the future as S&P 500 companies' increasing reliance on international sales and business for earnings. Despite the good correlation which means that they move in the same direction, the price movement magnitude is off. Too high in the 1970s and 1980s and too low between 1994 and 1998. I thought the consumer sentiment index would take care of this, but looks like the SMIM U.S. GDP model needs more help. Let's start by looking at the available historical data: S&P 500 versus the Consumer Sentiment and U.S. GDP in the two charts below. 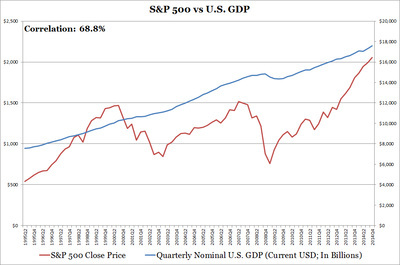 It's easier to see that S&P 500 and U.S. GDP are highly correlated at 95% over 60 years since they both go up exponentially. In the shorter term it's hard just using GDP to project S&P 500 performance. 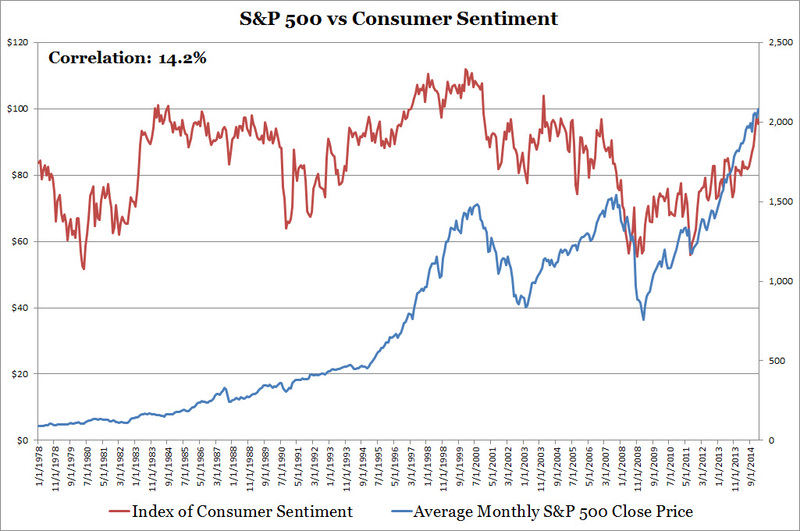 This is where The Index of Consumer Sentiment comes in to help track the movement magnitude. 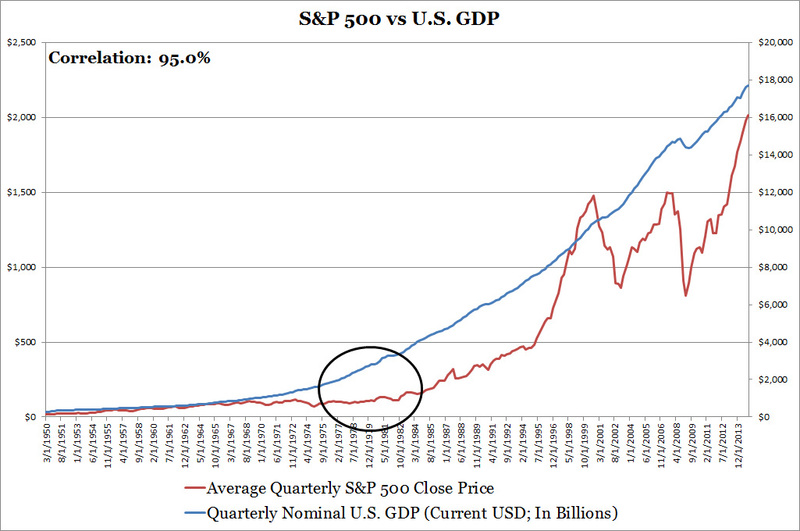 I will discuss why the black circle is on the S&P 500 vs U.S. GDP chart further down. The data I used relates more to the broader economy so it makes sense the model underestimates stock market prices during the Dot Com era. Finding a way to fully account for stock market movements during the Dot Com era may not be necessary since it was primarily caused by the irrational advance and subsequent decline of technology stocks. If my model was spot on for the Dot Com era I might question its accuracy as well. I have some more work to solve the movement magnitude issue and I do have a few data sources I can review. Inflation - Notice the black circle on the S&P 500 vs U.S. GDP chart above, this is a period of high inflation from the late 1970s oil shock. At the moment I'm using nominal GDP figures as it was my theory that inflation is priced into the stock market. However, that might not have been the case in the 1970s and during the elevated inflation in the 1980s compared to the years after 1990. Adjusting this could bring model results closer to S&P 500 prices in the early years. Investor Sentiment Index - If I can get a hand on a data set. This could help explain the Dot Com period miss. Volatility Index - I took a quick look at the data and the results look helpful for explaining stock market performance. S&P 500 trading volume - I looked at this on Saturday, I didn't see any observable patterns but I will keep it on the list. NASDAQ versus S&P 500 valuations - This will likely help explain the Dot Com bubble but I prefer not to use a stock market index to estimate another stock market index because they are sensitive to many of the same variables. Past GDP/Stock Market Performance - The stock market is subject to periods of momentum where gains fuel more gains and losses fuel more losses. I will look into this. Tentatively, I will have both SMIM World GDP and SMIM U.S. GDP in development. They will be used to help project stock market performance and support my other two investment models, but I will review model results carefully and let readers know the models calculations and results can change. When I get chance I will create a Stock Market Investment Model page on Adrian's Investment Models. Although it is frustrating to spend an entire Saturday backtesting and increasing model accuracy, predicting stock market performance has always been difficult. If it is easy we wouldn't have an entire industry looking at stock investments. All is not lost, I learned that over the long term (5-20 years) the stock market is driven by GDP with much of the shorter term fluctuations explained by consumer sentiment. Investors should focus on a long term buy and hold strategy with an eye on increasing purchases when consumer sentiment is low (below 90) and decreasing purchases or modestly trimming positions when consumer sentiment is high (above 100). Here's a hint below. The best way to act on this is to focus on the widely available S&P 500 ETFs (such as SPY) and mutual funds (such as VFINX). Even broad market based ETFs and mutual funds work as well. I will be time constrained for the next two weeks. At work, I have a major team project due Monday and some backlogged tasks. Besides that, I need to prepare my taxes. I'm looking forward to that :) But I will try my best to keep the new content coming. I will take a break from publishing another energy industry blog unless something major happens, however, I will still post the weekly model results this weekend on my energy page. 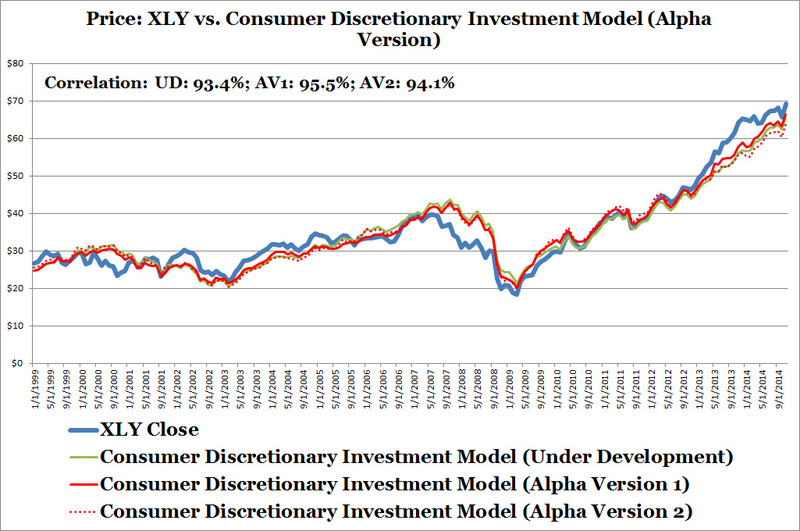 Although my energy page gets the most attention please spread some love for my Consumer Staples Industry Investment Model which tracks the slow but steady Consumer Staples Select Sector SPDR ETF (XLY); model results are also updated weekly. My goals is to eventually have all ten industry models up so we will have a macro view of the economy and which industries to invest. Below I will highlight three things I'm working on, my complete to-do list is at the very bottom. Wish I could dedicate more time to thinning down my ever growing list. 2. "Is The Consumer Staples Industry Just Spinning My Wheels?" I wasn't able to spend time on this blog entry last weekend, but I will try my best this weekend to move it along. The premises is that lately the Consumer Staples Select Sector SPDR ETF (XLP) has been stuck trading in the $47 to $50 range. Is this trend going to persist? I intend to make this a beefier consumer staples article compared to my weekly updates I normally publish. Here is the Yahoo Finance screenshot I have that shows it struggling to find a direction since December. 3. Backtest my Stock Market Investment Model. Going back in time to look at some data is the name of the game. The purpose of this backtest is to validate model accuracy in a different time period before I can have more confidence it works properly and that I haven't missed any key drivers of performance. Part of it involves looking at historical data for the Index of Consumer Sentiment. Check out the below. A healthy stock market generally registers at least a 90 on the consumer sentiment index. What this chart shows can also be useful in helping my research in market tops and bottoms. Build the Stock Market Investment Model (backtesting now). Is The S&P 500 Guided By Fundamentals Or Behavioral Tendencies? What is the best way to forecast S&P 500 movements? I've always been hesitant to estimate stock market performance. I prefer to focus on simpler areas such as industries and individual stocks. The stock market is so complex that estimating it will be difficult. Since I started Adrian's Investment Models, I realized that stock market performance is a significant input for my industry investment models, therefore it would be immensely helpful to create a stock market investment model. I believe in using fundamental data to look at the economy, industries, and stocks. However, the growing field of behavioral finance looks into how the stock market is not as efficient and anchored in fundamental data as previously thought. Therefore, by looking into both fundamental and "behavioral finance" data in the potential creation of an S&P 500 model we will learn more about whether the S&P 500 is guided by fundamental data or behavioral tendencies. I see the S&P 500 as two components. The first is 500 S&P 500 member companies' level of earnings. The second is the price to earnings (P/E) ratio or "market multiple". Level of earnings multiplied by P/E produces the S&P 500 price. I would need to find data that represents earnings and P/E. As a student in finance the first things that came to mind regarding predicting stock market performance is GDP or corporate earnings. This is logical since companies are invested in the economy. 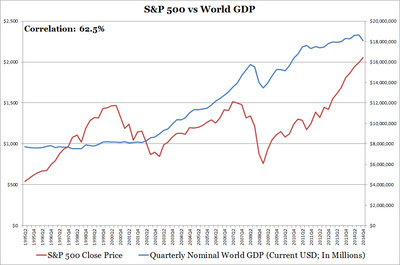 Please see the below three charts for how U.S. Corporate Profits, U.S. GDP, World GDP track the S&P 500. Click to enlarge the image. 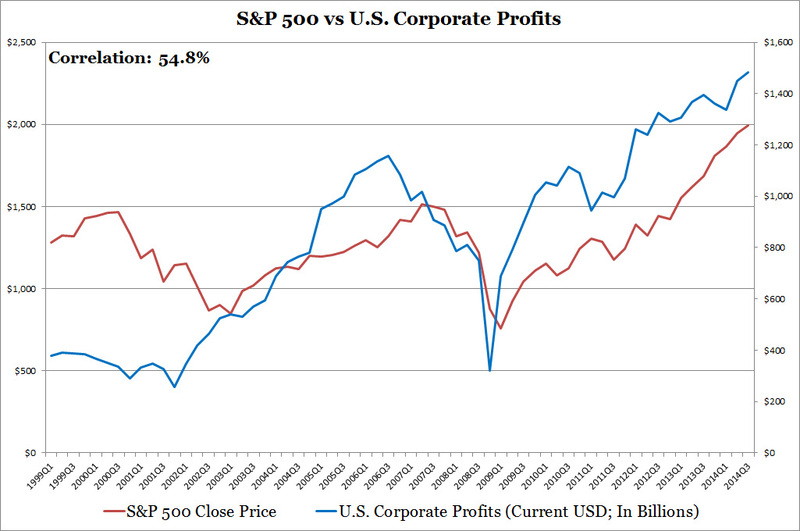 U.S. Corporate Profits, with a lower correlation versus both U.S. and World GDP, shows sufficient variation and seems to be a better fit. 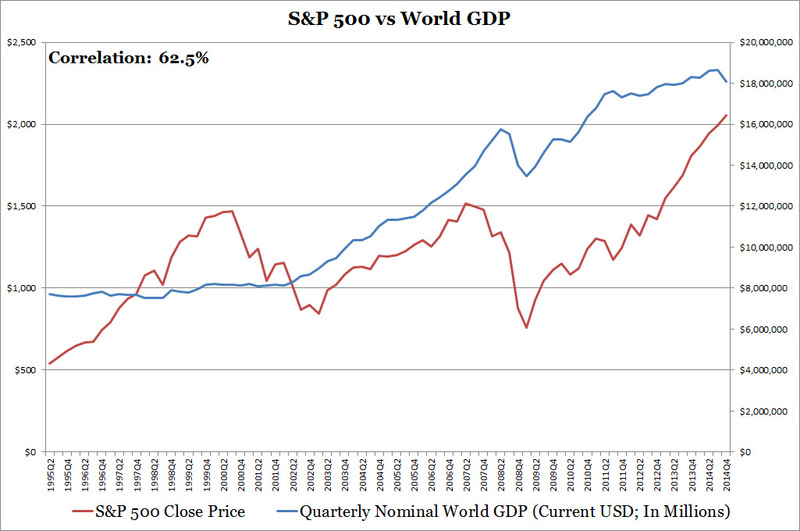 Visually, U.S. GDP does a poor job explaining S&P 500 volatility while World GDP has some variation. I don't find any of these a great fit alone. Let's look at some potential data for P/E. Going back to my classroom days, I learn that stock prices factor future expectations. 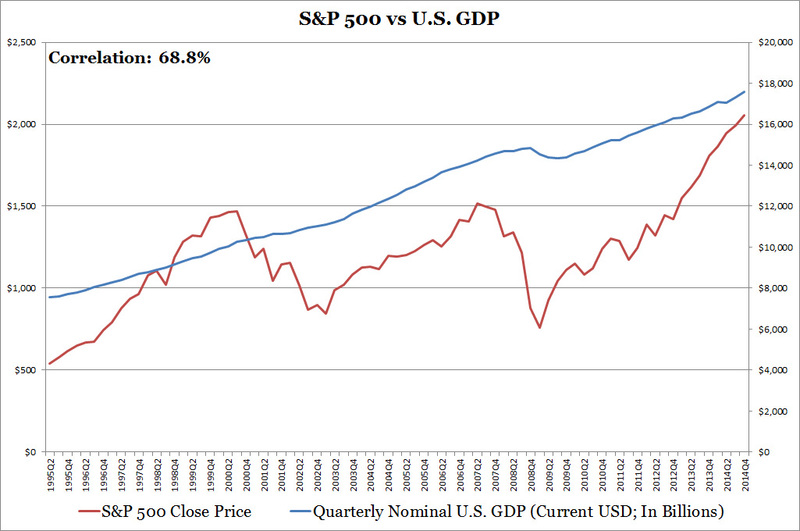 I found a loose relationship (48.1% correlation) between S&P 500 P/E and the GDP growth path. This makes sense as the economy keeps growing the P/E rises while an economic contraction lowers P/E. In order to find a better fit and a different variable, I wondered if behavioral tendencies such as confidence, momentum, herding, gambler's fallacy may explain P/E. This data would be hard to find as it would be crazy if I polled random investors on the street and asked them if they let confidence guide their investment decisions, if they suffer from gambler's fallacy, or exhibit herding behavior. The only data sources I knew that could indicate behavior tendencies are not on the investor related but consumer and home builder related. 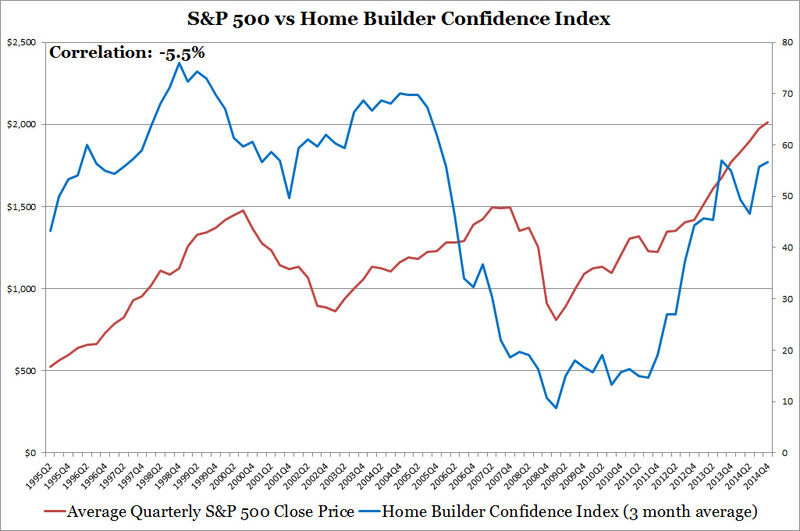 I turned to the Consumer Sentiment and Home Builder Confidence Indices. These sources are not completely irrational since respondents are likely informed of current events but their analysis may be different/flawed due to imperfect information, unique individual opinions/feelings, and individual confidence. Charts below. At first glance the correlation figures suggest no relationship between the S&P 500 and the consumer and home builder indices. Visually, the Consumer Sentiment Index loosely tracks the S&P 500 close price while the Home Builder Confidence seems to lead the S&P 500 by a few quarters. My concern with the Home Builder Confidence Index is that builders would be more influenced by residential market dynamics rather than the general economy. The Consumer Sentiment Index is more appropriate since consumer spending is 70% of U.S. GDP. Taken alone none of these data sources help figure out the S&P 500, I decided to use both the GDP data with the Consumer Sentiment Index and what I found was astounding. Let me formally introduce you to two alpha versions of my Stock Market Investment Model below. The original version uses World GDP with the Consumer Sentiment Index while the second version uses U.S. GDP with the Consumer Sentiment Index. Correlations and visual fit increased dramatically. GDP provides the general S&P 500 price trend while the Consumer Sentiment Index provides the volatility. When evaluating future stock market performance Investors should start paying closer attention to the Consumer Sentiment Index as GDP movements are far less volatile. 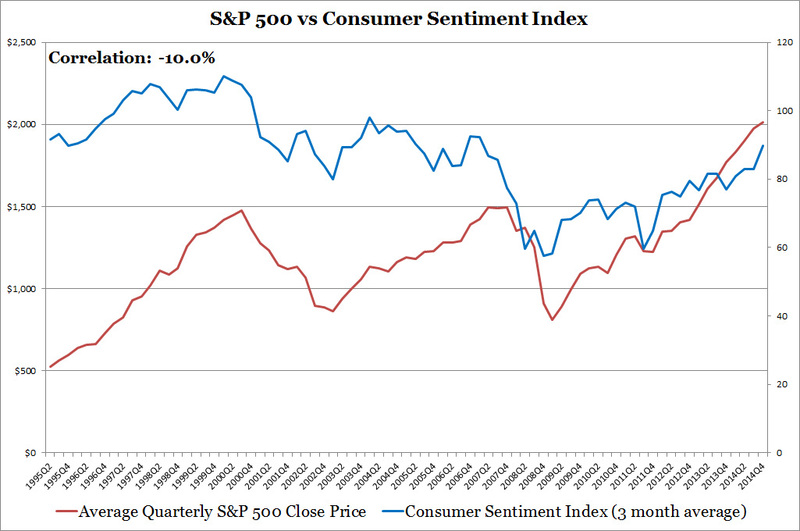 In my previous chart I showed consumer sentiment reaching 1999 levels. For the past few years the Consumer Sentiment Index is rising towards 1999 levels which is an early indication of an approaching market top and slower pace of stock market increases. I wouldn't immediately start selling because consumer sentiment even at high index levels (around 90+) tends to hang around for a while before dropping. Identifying a market top sounds like an idea for a future blog entry. Now that you know to take a look at GDP but paying special attention to the Consumer Sentiment Index, you can cheaply and efficiently trade S&P 500 ETFs when the time is right. Some examples include the S&P 500 SPDR ETF (SPY), Vanguard S&P 500 ETF (VOO), and iShares Core S&P 500 ETF (IVV). Most large mutual fund companies also have S&P 500 index funds as well. 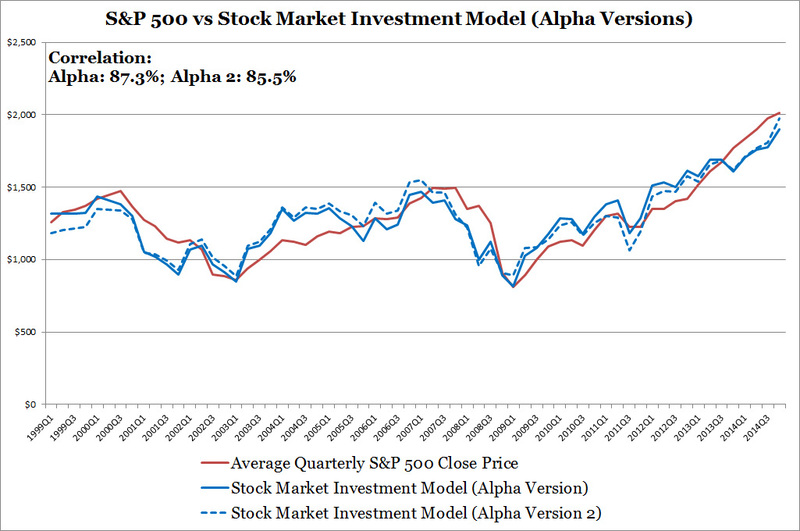 Going back to the stock market model, the next step is to backtest the two alpha versions and conduct additional research into more variables or develop techniques to further increase accuracy. I'm debating whether to dedicate a webpage to the Stock Market Investment Model. Thanks for reading, I hope to show you some backtesting results soon. *Disclosure: I don't hold or plan to trade any of the securities mentioned in this blog within the next 72 hours. This week lets look at U.S., Canada, and World ex U.S. and Canadian rotary rigs and crude oil production data. I only have international EIA data from 1994 to October 2014, so the information is a bit dated. However, it is enough to show that neither U.S. nor Canadian rotary rig count are closely related to crude oil production as shown in the first exhibit below. This puzzles me, but this is what the data says. The strange trend continues for the U.S. market, Baker Hughes' U.S. rig count fell from around 1,925 rigs in October to 1,348 in February while the EIA reports crude oil production went from 9.0 million barrels/day to over 9.3 million barrels/day. The second chart shows that World ex U.S. and Canadian rigs and crude production are closely related. I'm not sure why World ex U.S. and Canada data makes more sense than U.S. and Canadian data. Investors should be reminded that each market is different and to look at the data and not simply rely on rules of thumb. Energy investors are right to wonder where the market is going. This week oil prices continue to stay around $50/barrel. 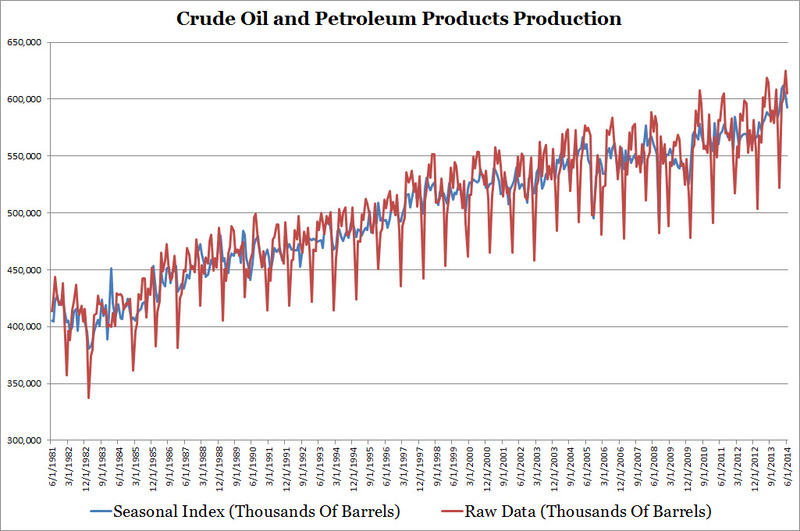 EIA's U.S. crude oil production for the week of March 13, 2015 reached another record high of 9.42 million barrels/day going up 6 weeks in a row from 9.12 million barrels/day during the week of January 30, 2015. Crude oil production has been above the 9 million/day range since November 2014. My Energy Industry Investment Model takes into account historical relationships between crude oil prices, crude oil and petroleum product production, and stock market performance estimates the Energy Select Sector SPDR ETF's (XLE) price. This week the model predicts a slight price increase to $68.11 from last week's $66.05 estimate. The increase this week is attributed to rebounding stock market performance. XLE's closing price on 3/20/2015 moved up to $76.91 from $74.63 last week as shown in the chart below. 2015 and 2016 prices use the U.S. Energy Information Administration Short-Term Energy Outlook projections as inputs for the model. I developed the Energy Industry Investment Model in early January and weekly updates are available on my website. 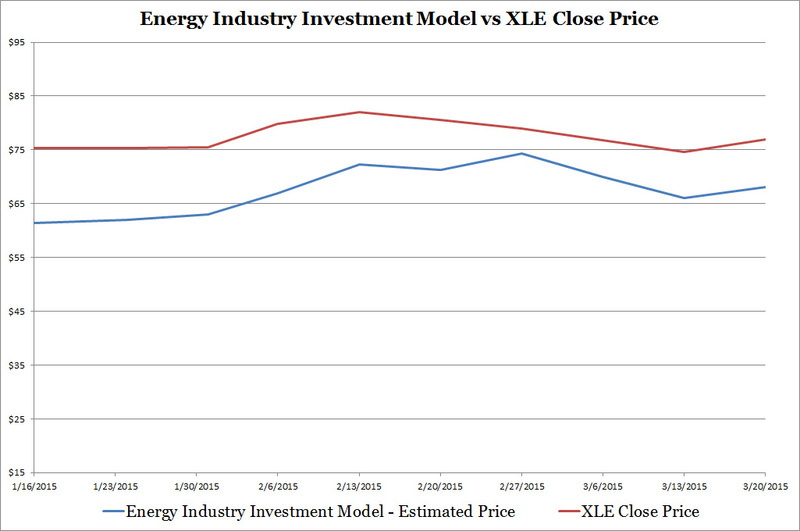 I plotted how my estimates are holding up against XLE's prices below. The gap between my model estimates and XLE's price can either be an indication of an inaccurate model or that XLE's prices are overvalued. Although no model is perfect I did my best to build it. As mentioned before the Energy Industry Investment Model relies on historical relationships between crude oil prices, crude oil and petroleum product production, and stock market performance. The model was built with data from the Great Recession which considers stress events and was backtested during the 1980s oil glut. My theory is that dividend investors are keeping XLE's prices higher than fundamental value, but I also need to conduct more research to support this view. Bottom feeding investors could also be propping up energy stocks as well, but I haven't done extensive research on it. Let's see what happens during next quarter's earning calls. I will be moving away from scheduled weekly blog posting on the energy industry but I'll keep supplying short weekly updates on the energy page of my website and of course I shall publish a piece if there are any noteworthy changes in the industry/model/model results.